Mary is part Vietnamese. Carter is a complete jerk. Normally, they don't talk much. But when Mary's in an accident on the way to school one morning, Carter nearly dies saving her life. The doctors say his chances of living are slim, and Mary's feeling the full weight of survivor's guilt. However, Carter's back at school in a matter of days, as if nothing had happened. Although, he is a little "glitchy," and he's developed a sudden and intense interest in Mary. She thinks he's suffering from major brain trauma from the accident. Or that he's been possessed. As it so happens, Carter really is possessed. And the thing controlling him is having the time of its life learning to be human. 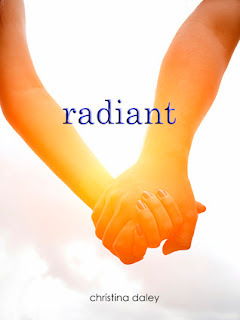 Featuring a diverse cast of characters, RADIANT is a funny "paranormal-lite" story about being human, being in love, and being healed. A voice called to her. It seemed close, and it was getting louder as the pain got sharper. "Hey? Hey! Are you all right?" it asked. Mary blinked several times before she could finally see again. She was in the middle of the street. The cars had stopped and people on the sidewalk were staring. "Are you all right?" the voice asked again. It was coming from a man wearing some type of uniform. "What…?" Mary tried to say more, but her voice suddenly stopped working. "Careful," he said as he helped her up. "Looks like you can move all right. Here, let's get you out of the street." He helped her over to the sidewalk. "Stay here. Someone's calling the paramedics." And then he was gone. Mary sat there, still in a daze. She started noticing familiar stuff all over the ground—an open book bag, books, folders, unused tampons, a shoe, and an apple with one bite mark. Her eyes followed the trail of debris to a brilliant red sports car, half of which was smashed in by a city bus. What had happened? Mary studied the whole scene, trying to puzzle together the pieces. Then it dawned on her. The car had hit her. Not intentionally. She had run in front of the bus without knowing it. It was about to hit her, but the car had gotten in the way first. It had saved her life. Mary thought about looking in the car. Then her feet sorta moved without her meaning them to, and she made her way to the passenger door. She recognized the person inside. Carter. She knew his last name, but she couldn't think of what it was. He was slumped over the seat with blood oozing all over his face. His eyes were shut. Mary knocked on the window. The tears in her hand stung. She beat the window with her fist. Mary stared. She couldn't believe it. On any other day, she wouldn't exchange two words with this guy. Just yesterday, he nearly mowed down an elderly couple while driving out of the school lot. Mary had secretly wished he'd be taught a lesson. But she didn't mean this. She tried the door handle, but it was still locked. Suddenly, Carter's eyes flickered opened. He looked straight at her. Mary gasped and pressed her face against the window. She stared at him, waiting for him to open them again. Waiting for any sign of life. But he was still like he was before. Hands suddenly took hold of Mary, pulling her away from the car. Her feet moved on their own again. Someone was yelling "Miss" a lot. Parts of her brain found other noises too, like sirens, voices, beeping, and other things. The hands directed her to sit on something hard and cold. "Miss? Can you hear me? Can you tell me your name?" Mary didn't answer. She still hadn't found her voice, and her mind was fuzzy, too. "Is that her bag there? Does she have a driver's license?" A different person spoke. "No license, but I found a student ID. 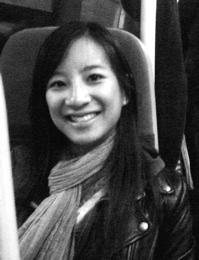 Her name's Mary Phan. She's seventeen and a junior here at Lewis Prep." Mary heard a third voice. "I just talked with some of the kids on the sidewalk. One of them said her mom's a nurse at the memorial hospital." "Find out how to contact the mom. Anyone see what happened?" "Cops are questioning witnesses right now. Looks like she ran in front of the bus. It would've nailed her if that sportster hadn't gotten in the way." "Anything on the bus or the driver of the car?" "Everyone on the bus looks fine. The car belongs to a kid named Carter Maxwell. Also a junior." A sigh. "I wouldn't hold my breath. He looks really bad in there." Mary tuned out everything else. All sights. All sounds. The only thing she could see in her mind was Carter staring at her. Christina Daley made her first book with neighborhood friends when she was four years old. They "wrote" out some semblance of lettering with crayons, cut up a cardboard box for the cover, and bound it all together with clear adhesive tape. It was brilliant. Quite a few years later, Christina is trying her hand at writing "real" books. She lives in Dallas, Texas, with a pet plant named Herb. GIVEAWAY: Winner's choice between these two prizes: one (1) ebook copy of Radiant OR a signed bookmark.